One of the most fun and valuable experiences that our volunteers have during their stay in Ecuador is to live and share with an Ecuadorian host family. To share a little of that experience with you, we decided to interview one of our host families every month. 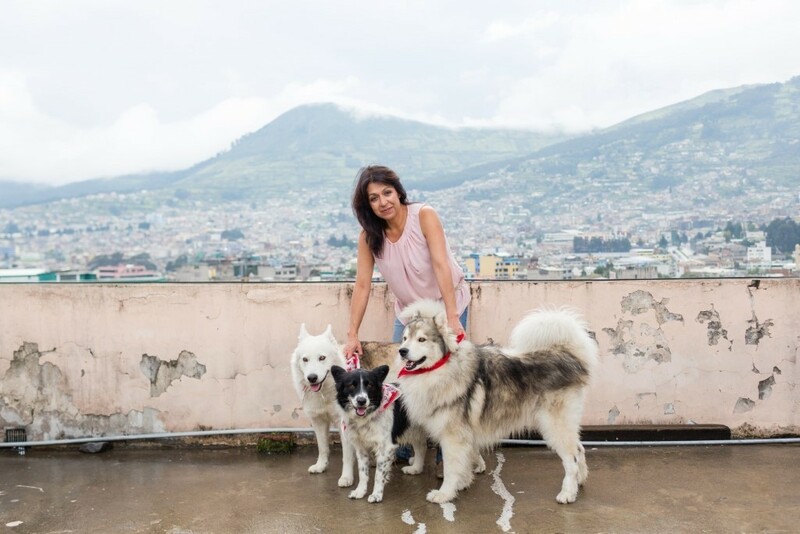 In June we paid a visit to the Robalino family, which consists of Elizabeth, her son Sebastian (24) and their three dogs. They are one of the families we work with the longest. Elizabeth and Sebastián at the same time: for 5 years. We started with Gerard in February 2014. And how did you get to know the foundation? Elizabeth: we saw the poster that said they were looking for families. Elizabeth: I wanted my son to speak English. How would you describe the Local Dreamers foundation and its volunteers? Sebastián: it’s amazing. For me, personally, it has allowed me to know a lot about their culture. Oh, and the ‘stroopwafels’ … The people, their personality. I met a whole new world. Now I have many brothers and sisters. Elizabeth: knowing them has been very pleasant. I learned some new words. The volunteers are saints. Some guys are very generous. And not only in words. They are very kind. Sebastián: yes it is true. The Dutch culture is very nice. And volunteers sometimes cook and it’s very delicious! Elizabeth: apart from that, the work and the projects that the foundation carries out are excellent and help a lot of low-income people. From your experience, what are the biggest cultural differences between volunteers, and Ecuadorians? Elizabeth: education. The vast majority of the Dutch are much more prepared than the Ecuadorians. For example they like to read. Sebastián: and in music there is a great abyss. They listen to music that is completely different from that of the young people here in Ecuador. I learned from them and they learn from us. Elizabeth: shoot, Sebas, you will not let me speak. Yes they are very educated. What else was I going to say, they are also very sensitive people. People with a very open mind. In religion: the volunteers also believe but it´s all a bit more flexible. Elizabeth: with Michelle and Anouk who lost their keys. Or Gerard who found the dogs in his bed. And Ziggy and Martijn slept outside because they were so drunk they could not find their keys. Sebastián: it’s so difficult. I can not choose, there are so many moments. But one of the coolest moments I had was during my birthday when we went to eat with Martijn. We ate sushi and he invited me. With Simon we drink until 4am in the morning. And with Dion we play the playstation a lot. What was the craziest thing that happened with a Local Dreamers volunteer?